Before I begin sharing some secret Feng Shui to give your student and educational edge I thought that I would tell you that to the Chinese, scholastic success if of paramount importance especially for students who come from humble beginnings and backgrounds. It has long been espoused by this modality that one way to get ahead and get straight As will be guaranteed following some of these Feng Shui cures. Chinese families throughout the world work hard to do whatever they can to make sure that their children do well in their studies. The belief is that the best way of improving the status of any student and for them to create a lucky lifestyle and status too. Therefore getting good grades is considered the universal key to a successful life - and isn't that what we all want for our burgeoning scholars? According to Feng Shui, one way to get motivated to study and respect education is by energizing what is called the 'Knowledge and Self-Cultivation' corner of the student's room, This is in the upper left-hand side of the room and can be activated by placing a crystal globe in this corner. Occasionally spinning the globe is said to bring the name and reputation of the student out into the world (hence, the globe.) In fact, putting a crystal globe in this particular space will help to activate all sorts of fortune and luck, not just scholarship luck. Of course as with everything taught by Feng Shui it is considered incredibly important to make sure that all clutter be cleared from the aforementioned corner and from the entire room that the student studies in. Accumulating junk in this part of the room (and in the front left-hand corner of the living space/house) will block education luck so the student should make it a point to keep their room tidy. They should throw away old papers and notes and organize files. Feng Shui says that de-cluttering the bedroom and/or study space will give education luck a positive and immediate boost. As well as the crystal globe there are other excellent symbols of education that the student can surround themselves with for scholarship success. For the purposes of attaining great grades and for students looking to expand their minds they can hang an image or picture of geniuses such as Albert Einstein. The student can pick any such mentor or figure that symbolizes intellect and/or aspirations that the student has. Having this kind of image hanging in he bedroom will help the student absorb some of what the pictures stand for. The beautiful part of this cure is that the student won't even need to do anything as the positive energies are said to enter by osmosis. This modality says that one of the potent symbols of scholastic success is called the Dragon Gate that depicts a carp jumping over a dragon gate ad turning into the most auspicious of creatures, the mighty dragon. This is a well-known legend in China that stems from ancient time and speaks to the student rising in stature in the world by means of education. This imagery offers hope to any student hoping for academic success so every student should, besides the crystal globe and the image of a mentor should have an image of the Dragon Gate in order to find big luck in the pursuit of scholastic endeavors. The tradition also instructs the student to use music to create healthy energies and chi. Contrary to what many people believe, music can aid concentration and creativity. Studies have shown that playing classical, specifically Baroque music in the background will increase productivity. Any student can energize study luck with a personalized quartz crystal as well. This crystal is thought to be one of the most powerful mediums of knowledge retention. Natural quartz crystal is said to represent the purest form of Earth energy and are believed to make conducive tools for student hoping to achieve exam luck. While the crystal can be displayed in the 'Knowledge' area of the study space or bedroom in order to have the crystal resonate with the student's energy. Holding the crystal in the left hand is thought to hold some magical powers. Just be sure that the student takes the personal crystal that they have selected and soaks it in water with rock or sea salt for 7 days and 7 nights to cleanse it. The student can hold the crystal in the left palm when studying or even revising and ten the student will be surprised how this one simple exercise will help them retain information for later on. When the scholar is not holding the crystal it can be placed on the desk until the student feels the need for some inspiration - then it should be picked up with the left hand once again. Feng Shui says that the student should wear white whenever giving a presentation. The colors anyone wears can have a big impact on personal energy and also on any impression that can be created. Whenever studies requires the student to make a presentation in class or even to interviewers it will behoove to look authoritative. Therefore, wearing the color white lends a certain assertiveness. White is the color most associated with the element of metal in Feng Shui and will convince others of the student's prowess or leadership qualities. The color yellow is perfect when there is a marathon study session going on as this is the color of the sun and has an ability to bring uplifted spirits and cheer. Wearing red boosts energy levels and is considerate the ultimate yang color. Therefore whenever the student if feeling lethargic wearing this color most associated with fire will bring the luck of recognition and heat up efforts at success. Speaking of the sun, the symbolism accorded the Three Suns to improve performance at school. When the student is aiming and aspiring to break through a barrier you can capture the sun's energy by displaying Three Suns. Having this symbolism in a study space helps the student to be propelled to the top tier of the ladder of success. Lastly, the student should never have shelves above their bed. Shelves above the head where the scholar sleeps is not only considered dangerous from a physical perspective but is also dangerous from a Feng Shui angle. Keeping anything on shelves that have been suspended above a bed represents burdens and blockages and make whatever the student wants to achieve difficult to accomplish. 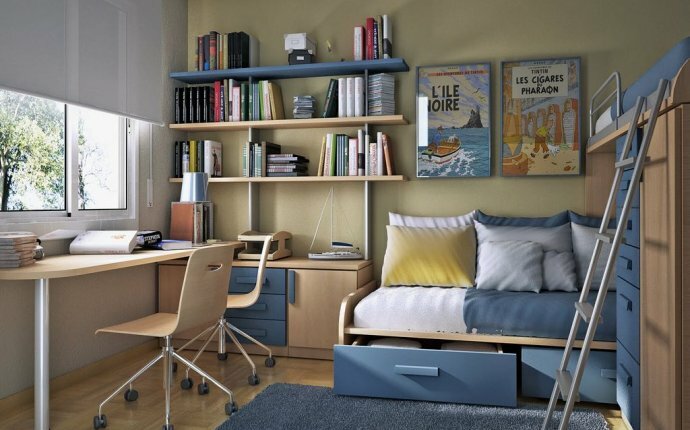 The student should dismantle such shelves or can move the bed to another part of the room if it's impossible to remove the shelves.